Hello, and I would like you to meet Gracie, named after Gracie Allen. Born Dec. 24 2012. She is a mini schnauzer and full of spirit. She came as an unexpected gift, and the greatest gift ever. Well, it happened like this. I was at home one day and got a phone call, "Guess what?" my mom says, "Guess what I found you?" I had no clue, while she was sitting in the vets office a lady had a box in front of her, and out popped a little head, and there she was, and it was love at first sight she said. Well, the next thing I know mom shows up with the cutest, most adorable little puppy I believe I have ever seen. I was over whelmed, she just sat in my hands so admirable and content, her little eyes would look at me, and my heart just melted. 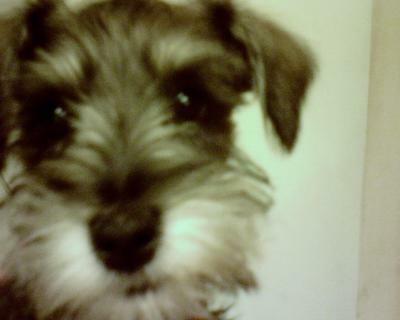 I had a mini schnauzer before, best friend ever, but to this day I do not know what happened to him, he just disappeared. Since that happened I never gotten another dog, or pet for that matter. Gracie has been the best little companion I could ever ask for, she is so smart, so full of life, all in all just my best little buddy,and she goes with me everywhere. So this is Gracie, the unexpected little friend that has brought joy everyday I have had her. Do I spoil her? You bet I do, she gets only the best. It is the least I can do for what she gives to me, unconditional and dedicated love, and companionship. Your little Gracie is adorable! No matter how much love you give her, she will always give you MORE. I have 2 -Sydney (black and silver) and Rylie (black). They make my life wonderful! We are so lucky to have schnauzers! Wow... lovely to see Gracie..
She is soo lucky to come to your home. Yeah, we need to train them a bit to stay indoors and walk by our sides. They have a run off tendency though! Return to 2013 Schnauzer Photo Contest.